The name of the aircraft designer Vladimir Mikhailovich Petlyakov today is half-forgotten. Unless the mention of the legendary front-line dive-bomber Pe-2 returns it from the past. Prior to the war, Petlyakov worked with AN. Tupolev. In the very first days of the war, he formed his design office, which was engaged in the construction and modification of aircraft. Petliakov completely slipped into Stalin's "sharaga", where he was forced to do the same things he did at liberty. He went through humiliation, but remained faithful to aviation. It is unfortunate that Petliakov remained in the shadow - one of the most outstanding aircraft designers, who created remarkable aircraft, deserves the grateful memory of the descendants. Vladimir Mikhailovich Petlyakov [ June 15(27) 1891 - January 12, 1942] was born in the village of Petlyakov Sambek near Taganrog 15 (27) June 1891. Soon the family moved to the city, and then to Moscow. After the death of his father, Mikhail Ivanovich, his mother Maria Evseevna was left with five children. She returned to Taganrog and earned a daily wage labor. Volodya loved tinkering. In 1902 he graduated from the three-class parish school and enrolled in Taganrog secondary technical school. Here the boy showed the ability to work with your hands: he made a bookbinding machine and the drawing board. In the fifteenth year he had to go to look for jobs in the railway workshops and a fireman. In 1910, after graduating from college, Vladimir was leaving to study in Moscow. However, in the first year he entered the Moscow Technical School, where he failed. The following year, the young man became a student at MTU. Material difficulties forced the family of Vladimir interrupt their studies until 1921. A few months later, after the return to school of Vladimir Mikhailovich joined the staff of TsAGI. He was invited to continue his studies and work with Tupolev. In 1922 Petlyakov preparing a thesis project "Light single sports monoplane." Tupolev approved the development of machine parts made of aluminum and has helped, especially since he himself was a supporter of the metal planes. Petlyakov graduated from Moscow Higher Technical School, and participated in the development and production of ANT-1. He became a close aide to Tupolev. They created an all-metal ANT-2 lightweight fighter, and on May 26, 1924 ANT-2 first flew. In one of the first flight and the wing design was that of Petlyakov. He ws also the engineer for test snowmobiles and gliders. In August 1925 the Tupolev Design Bureau completed work on the creation of ANT-4 heavy bomber (TB-1). 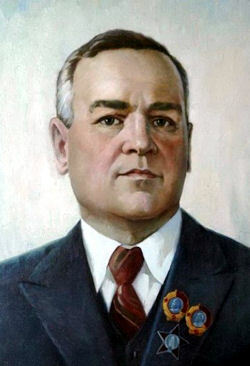 Petlyakov was responsible for aircraft assembly at Khodynka. In developing the proposed method of calculating the wing design, the "method Petlyakov" was used in aircraft used corrugated paneling. In "The method of calculating metal airplane wings" Petlyakov wrote that the essence of the method in the evaluation of joint work spars, ribs and skin. On production, he suggested the manufacture of tubular structures method of inertial riveting. Within a few years, this method was used at "Ju" in Germany. Since 1929 Vladimir organized series production of the TB-1. His contributiosn were not limited to only the design of the wings. In the early 1930s Petlyakov led a brigade of heavy aircraft, participating in all stages of development and production. He became the right hand Tupolev. V.M.Petlyakova's unit was responsible for the construction of ANT-6 (TB-3). In this case, the idea of a military engineer VS Vahmistrova was for a heavy bomber which lifted on the wings of fighter aircraft to deliver them to the battlefield without fuel consumption. "Maxim Gorky" has begun construction of the aircraft in July 1933. Wings expected V.M.Petlyakova team. Their weight was 61% of the weight of the machine. Petlyakov tried to strengthen the wings, crossing three spars of 2-3 meter ribs. The next machine, the development of which Petlyakov actively participated, was the ANT-25 or RD (record range). Vladimir designed the unusual wing span 34 meters. He later wrote in TsAGI factory newspaper:. "Lovely flight data of the aircraft were provided by the machine's scheme: monoplane, high elongation of the wing and retractable landing gear in flight." One of the main difficulties in the construction of airplane wings was precisely the creation of a high aspect ratio. Indeed, in the relatively small volume of the wings had to put a very large amount of fuel required for the implementation of long-range flight. In other words, it should make the wing a fuel tank. For this it was necessary to spend most experimental research work on the study of the vibrations of the wings. In the summer of 1936 Petlyakov appointed head of the design department and first deputy and then chief designer of the plant experienced designs at TsAGI. The most important task was the construction of four-engined ANT-42, which was supposed to replace TB-3. The aircraft design called the TB-7, began the summer of 1934. The prototype appeared two years later, and at the end of 1936 for the first time the plane took off and was highly regarded as a test pilot M.Gromov. During this period, Vladimir went to France and in the US shows. In the fall of 1937, Petlyakov was arrested for organizing the "Russian-Fascist Party" (?!) with a group of workers at TsAGI. Arrested following the Communist Party concept of massive purges, there were no signs of real guilt, and his life was spared. But like many other arrested aviation specialists, was imprisoned in a special closed KB in Moscow (TsKB-29). Along with hundreds of other skilled professionals, he continued to work in special team (division 29, KB-29) within NKVD system. Petlyakov's KB-29 was a part of STO Spetsialnij Tekhnicheskij Otdel [Special Technical Division - "sto" also means 'Hundred' in Russian]. After his arrest in November 1937, he was allowed to go back to his work in aircraft design at a "special technical prison" run by the NKVD, the state security service led by the dreaded Lavrenti Beria. Such technical prisons were nicknamed "sharashkas", a Russian term that roughly translates as a criminal gang, which is how the unfortunate residents were officially regarded. The giant design bureau of the patriarch of aviation Tupolev seemed unshakable, but not for specialists from the Lubyanka. For them there were no authorities. It was the turn to recognize Tupolev as the enemy of the people, and he thundered with all his deputies into a special "sharaga" where they were instructed to design aircraft. To begin with, Petlyakov was knocked out during interrogation. From him they sought confessions in espionage. Vladimir Mikhailovich did not leave any memoirs, so it is unknown what the years spent in the "special department" cost him. The repressions divided the Tupolev Design Bureau into three separate project teams, which later received the status of independent design bureaus and their production base. The names of Andrei Nikolayevich Tupolev and Pavel Osipovich Sukhoi remained in the marks of aircraft. The name of Petlyakov belongs only to history. The engineers in the sharashkas worked long hours, and they were not allowed the privilege of signing their design documents, instead being issued numbered stamps to identify their work. The only compensation was that the sharashkas were comfortable, at least by the extremely rough standards of the Gulag, and the engineers were likely to survive their imprisonment. The Kremlin believed that prison conditions did not allow designers to "distracted" and will as soon as possible the necessary machines. In the "sharaga" Petlyakov designed a high-altitude fighter with a sealed cabin, which received the code designation "100". This, apparently, in memory of the "Special Department". The plane turned out to be unusual even in appearance. The war in Spain showed that the fighters on which the bet was made are not the main ones in the sky. The Soviet Union needed bombers with good flying qualities. By a decree of the government, Petlyakov was offered to make a dive bomber from the "hundred". Everything was done in about two months. Vladimir was for first time an independent head of a KB. In the detention conditions the petlyakovskaya team worked on the project fighter-interceptor with an index of 100. Backed by a group of experts, he began to develop a new type of fighter. It was distinguished by a pressurized cabin, speed of 630 km / h and remote electric control. In May 1940 at the May parade fighter demonstrated aerobatics. The new task KB was consisted in the development of "100" dive bomber based fighter. The term for the development was given only 45 days. He created a layout so that itws possible to immediately began mass production; the first production aircraft became proficient. As is known, the development of the Pe-2 was started by the forces of designers and engineers led by VM Petlyakov in a special design bureau of the NKVD, SKB-29 in mid-1938. Created on the basis of the experimental two-engine high-altitude fighter 100 (VI-100), which was in some way a Soviet clone of the German heavy fighter-bomber Me-110, Pe-2 made its first flight on December 22, 1939 at the airfield of the LII in Zhukovsky under the pilot- by the tester Stefanovsky PM, at the end of the tests it was launched serially in late 1940. And Petliakov in the shortest time coped with the task. L.P.Beria, who was in charge of the closed design bureaus at that time, promised that the aircraft designers would be released for the successful completion of the tasks. And Petliakov was released in 1940 for the successful development of a new machine. Petlyakov became the chief designer at the aviation plant in Kazan. He was forgiven, but not completely. Kazan became the place of refuge of I.Kurchatov, A.Tupolev, S.Korolev and many scientists who fell into the millstones of repression. Kazan for them was a reference, where they were created all the conditions that they were engaged in science. The production of the aircraft, called the Pe-2, was set up at the Kazan Aviation Plant. With the outbreak of the Great Patriotic War, many workers and engineers were called to the front, which adversely affected the quality of aircraft production. Teenagers and women worked in their place and even 100 Uzbek workers were sent, who were not taken to the front because of their ignorance of the Russian language. Following success of the '100' aircraft and conversion of this high altitude fighter into diving bomber (July 1940), in the summer of 1940, Vladimir Mikhailovich was pardoned, and in early 1941 awarded the State Prize of 1st degree. After the start of the Great Patriotic War, KB Petlyakov settled at the production plant, heavily engaged in the production of forging dive bombers. When the Great Patriotic War broke out, his OKB was transferred into NKAP. In October 1941 V.M.Petlyakov's OKB was evacuated eastwards. In the very beginning of 1942 mass production of Pe-2 was back at full steam. The Pe-2M with a raised wing allowed hanging five hundred klograms of bombs. Soviet bomber regiments, armed aircraft Pe-2, has successfully carried out combat missions. The German fighters experiened heavy losses. Soviet bomber regiments, armed aircraft Pe-2, successfully carried out combat missions. In the summer of 1945 in the newspaper "Pravda" was a photograph of a dive bomber Pe-2 with the words "Weapons of Victory." On January 12, 1942 Petlyakov and his deputy flew to Moscow on two new Pe-2 aircraft to meet with the country's top leadership on the return of aviation specialists from the front. At the airport he had a conversation with SA Shestakov, who, as if in anticipation of the tragedy, he did not recommend to Vladimir Mikhailovich to fly on a passing attack aircraft. The plane crashed near the town of Arzamas, and the whole crew and VM Petlyakov was killed. A.M.Izakson assumed control of Petlyakov's OKB initially, but was soon replaced by Putilov and then Myasishchev. Tribute to him came from the distant Siberian city of his mentor and friend Tupolev. Pilot test P.M.Stefanovsky recalled: "I worked for many years with the designer. He was a wonderful a man. Simple, polite, well-balanced, ever possessed by new thoughts, ideas, looking for ... "
V.M.Petlyakova's obituary was written: "Almost 25 years of his life companion Petlyakov given to the establishment of Soviet aircraft. Among the employees of our aviation name Vladimir Mikhailovich is widely known as the author and designer of a number of powerful Soviet aircraft, the Soviet Union won the glory of the mighty air power."